As mentioned earlier, when water—which has a low inherent conductivity—is polluted, its conductivity increases. For this reason, conductivity is widely used as an indicator of pollution in rain, river and lake water. The conductivity of tap water and drinking water, which we actually ingest, and the water in swimming pools, which comes into direct contact with our bodies, is also regularly measured. 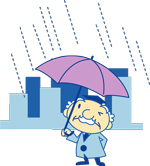 From the viewpoint of environmental protection, it is very important to monitor rainwater pollution levels. As the term acid rain indicates, pH is important in the monitoring of rainwater pollution, but conductivity is also a very important factor, and is monitored along with pH. In practice, some types of pollution cause high conductivity without greatly affecting pH value. Before being discharged into the environment, waste water has to be treated such that it contains the minimum level of contamination. Conductivity, which is an indicator of contamination, is monitored 24 hours a day at the discharge stage in factories and sewage-treatment plants. The salt contained in food is in the form of dissolved sodium chloride. The more sodium chloride is dissolved, the higher the salinity (the saltier the substance is). Salinity is roughly proportional to conductivity. This principle is used in food salinity measurement, with conversion of conductivity to salt concentration being a widely used method. Limiting salt intake to a moderate level is important to maintaining good health, and the salt meters used to ensure this convert conductivity to salt concentration. Cleaning water is used to clean electronic components in semiconductor production lines and glass plates in LCD panel production lines. Even a tiny amount of impurity remaining in this type of water has a serious impact on product quality. Ultrapure water, which is of higher purity than purified water, is used for cleaning these products. Furthermore, conductivity is used as an indicator of purity, and is constantly monitored so as to keep its value below a specified level. In addition, purified water, with a low level of impurities, is used in the production of food, beverages, and pharmaceutical products. Here too, conductivity is used to control its purity. These types of industrial water are classified according to their purity level in JIS K0557, with conductivity being used as an indicator of purity. Since the tap and river water with which we are all familiar has various substances dissolved in it, it is not actually chemically pure water (H2O). Although this does not present a problem when we use it in everyday life, water of higher purity is required for scientific research, various industrial applications such as manufacturing, and medical uses. When we take the tap or river water that exists around us and increase its purity by removing the substances dissolved in it (i.e. electrolytes), the conductivity of the water gradually decreases. If all the electrolytes are removed, will the conductivity reach zero? The answer is no. This is because an extremely small proportion of water molecules (about one in 500 million) ionize to give hydrogen ions (H+) and hydroxide ions (OH-), so that the theoretical conductivity of water at 25°C is 0.0548 μS/cm. High-purity water with a conductivity of 0.06 μS/cm or lower is used in the semiconductor industry in the cleaning processes of electronic component production lines such as for VLSI manufacturing. This type of water is referred to as ultrapure water. Although not to the extent of ultrapure water, the conductivity of water can be decreased to 1 µS/cm or lower through the process of deionization. Water that has undergone this process is known as ion-exchanged water or deionized water. When we talk about pure water, we are referring to water with this level of purity. Incidentally, when water comes into contact with air, carbon dioxide dissolves in the water, causing its conductivity to rise by about 1 µS/cm. Therefore, even this can significantly affect the conductivity of purified water. Water with a high calcium and magnesium ion content is called hard water, and that with a low content is called soft water. Accordingly, “hardness” indicates the level of content of these ions. Water hardness is said to influence, to some extent, how good the water tastes (“Tasty water study group,” Health Ministry, April 25, 1985). Unfortunately, water hardness cannot be obtained directly by measuring conductivity. However, as a high level of hardness results in high conductivity, some people maintain that conductivity can be used as an indicator of how good the water will taste. A method called titration is often used to determine the amount of substance dissolved in a liquid. Titration is a volumetric technique in which a specific reagent is added drop by drop to a solution of a particular substance, the added reagent causing a change in the characteristics of the solution and thereby allowing determination of the amount of substance dissolved. Conductivity is often used as a measure of the characteristics of the solution, and it is particularly widely used in chemistry research. In addition, titration using conductivity is very important for studying the characteristics of electrolyte solutions containing a large amount of ions. Basic college experimental courses and textbooks often refer to this method, or use it to provide an introductory electrochemistry experiment dealing with electrolyte solutions.